There is a long history of journalists venturing into the depths of a mysterious unknown, in hopes of illuminating dark secrets and elucidating murky waters, of communicating to curious outsiders what exactly goes on in the belly of a bizarre beast. I can think of few bellies as beastly (and as bizarre) as that of Christian Zionism—a movement consisting primarily of far-right Christian fundamentalists whose pro-Israel fanaticism is only matched by their deep-seated eschatological anti-Semitic belief that, upon the impending apocalypse (which they have no doubt will happen in their lifetime), Jesus will return, and ruthlessly spill the blood of all of the Jews who refuse to accept him as their savior, before damning them to the fiery depths of Hell for all eternity. A year ago this week, Christians United for Israel (CUFI)—the largest pro-Israel organization in the US, with over two million members—held its ninth annual summit. Close to 5,000 people, mostly Christians, along with some Jews, gathered in Washington, DC to celebrate Israel just two weeks into the nation’s 51-day attack on Gaza, code-named Operation Protective Edge, mere days after the beginning of the Israeli military’s ground invasion. Almost 500 Palestinians had already been killed when the summit took place, and 1,700 more were to lose their lives in the coming weeks. I attended the event with the intention of gaining a deeper understanding of the Christian Zionist movement, but to be frank, I left the conference even more befuddled than I had been before I entered. At the time, on the hot and stuffy evening of July 21, as Christian extremists clasped hands and danced a pseudo-hora to traditional Ashkenazi music blasting through the speakers of DC’s colossal convention center, Israeli missiles (paid for with US tax dollars) were raining down on Gaza like a torrential storm of suffering and death, destroying hospitals, shelters, schools, homes, mosques, and, yes, even churches. Operation Protective Edge was just in its second week and 30 more days of destruction were to follow. I had hoped to report on the summit at the time, yet found myself unable to do so. Hundreds of Gazans had been slaughtered since the Israel Defense Forces (IDF) had begun its ground invasion; the “most moral army in the world” had bombed a third hospital only the day before the summit. There were just too many stories to cover, and too few journalists to cover them, in a stifling political climate in which journalists could be, and were, chastised and even fired for telling the public about Israel’s mass execution of droves of besieged Palestinians. Moreover, and perhaps more importantly, it was a period of great tragedy, of intense and seemingly ubiquitous human suffering, and I could not bring myself to write about a summit that was nothing less than farcical in its degree of unmitigated absurdity. I knew the result would inevitably be comical, and Mivtza Tzuk Eitan (“Operation Strong Cliff,” the name of the operation in Hebrew) was truly no time for comedy. Now, thinking back, the conference stands out in my mind precisely as an extension of this period of great suffering, as an affront to all those who purport to honor the values of Christianity, Judaism, or of any other religion. Today, CUFI continues to duteously back Israel no matter what it does and is currently devoted to sabotaging the Iran nuclear deal. At CUFI’s 2015 summit, held earlier this month, roughly 5,000 of Israel’s most extreme supporters met to discuss how they can undermine the international diplomacy. Just days ago, it held an off-the-record event with Wall Street Journal foreign affairs columnist and editor Bret Stephens, secretly plotting against its own government’s international negotiations. A look back at CUFI’s conference during the last war in Gaza—when rockets were flying, emotions were flaring, and Israel’s supporters were rapidly radicalizing—can remind us just how extreme the organization is. A year later, I reflect on the 2014 CUFI Summit as a synthesis of the dialectic: both tragedy and farce, simultaneously. When I ambled up to DC’s 2.3-million-square-foot Walter E. Washington Convention Center, in a small group of Jewish Voice for Peace (JVP) and CODEPINK members, there was no dearth of protesters already outside. And we were early. On the inside, I was met with an enormous line, trailing across the voluminous room. The word “Zion” was omnipresent, as were Bible quotes. The summit even had a hip hashtag contest, with styling CUFI “I Stand with Israel” merchandise! People were excited. I even pretended to be. When I finally stepped into the room where I would spend the next few hours of my life, I immediately heard a roar, of fervor, of faith, of what Žižek would call Ideology. Well, and music too. Ashkenazi folk music. Those were just my ears. The first thing that caught my eye were the flags. Boy, were there a lot of flags. Did I mention there were a lot of flags? They were everywhere. Everywhere. The jingoistic flag-waving was enough to make any internationalist uncomfortable. Yet, in the CUFI Summit, one could not look anywhere without seeing waves in a gigantic, monstrous sea, no, ocean of nationalistic bigotry. A black friend who attended the summit with me reflected on the event afterward, saying “It was one of the most racist environments I’ve ever been in.” She said she could almost feel the racism; it was practically palpable. The event can be roughly summarized as an attempt by both the Christian Zionist community and the Israeli government to build anti-Muslim solidarity. I heard some of the most outlandish myths about Muslims. Islamophobia was more than just the theme of the gathering; it was pungent, mephitic in the very air we breathed. In true megachurch fashion, the event felt like a combination of a concert, a political rally, a series of propaganda speeches, and an impassioned Christian service. I took copious notes (multiple pages) throughout the night, getting juicy quotes from the seemingly ceaseless slew of speakers. Hagee’s speeches at the summit were full of similar rhetoric (sans Hitler). Anyone with even the most rudimentary knowledge of the history of Israel knows that it was founded in 1948, not three millennia ago. Hagee practically accused Obama of heresy for acknowledging that international law considers East Jerusalem to be occupied Palestinian territory. “America should never pressure Israel to divide Jerusalem,” the Evangelical megachurch pastor maintained. In spite of Hagee’s well-documented anti-Semitism and Christian extremist proclivities, the CUFI leader is a close ally of Netanyahu and Israel’s ruling right-wing Likud party. “You’ve been terrific; you’ve been supporting Israel through and through,” Netanyahu told the audience. “And that’s important on any day, but especially on this day, when Israel is targeted by the forces of darkness and terror, and all our cities are being rocketed, when we need people to stand up and say ‘enough is enough.’ Not enough of Israel’s legitimate response of self-defense, but enough of the castigation of Israel,” he said. Netanyahu characterized Islamist movements as a “barbarism” and a threat to the mutual civilization shared by Israel and the US. You know the truth. You know that we’re fighting the same terrorists who are in Syria—the ISIS, the al-Qaeda, the Hezzbolah, the Boko Haram. This is what Hamas is. They are the same intolerant breed that denies human freedom and human rights anywhere. They’re the same people who want to eradicate the state of Israel, whom they see merely as a small Satan. And you know who the big Satan is; it’s you, the United States, with the freedoms and the values that we share. I know you have a complete clarity on this. And I want you to know something else. Throughout our region, there’s turbulence, with the rise of Islamic militancy. All these fanatic groups attack Israel; they want to destroy Israel without a doubt. But they also want to destroy Christians. They persecute Christians and they burn churches and they drive Christian communities away. There’s only one place in the Middle East where Christians are free, absolutely free—their freedom of worship, their rights are guaranteed. And that’s the state of Israel. And I know you know that bond, this civilizational bond, between us and our common heritage, is what’s at stake here. I know that you know that we stand up for something so valuable, the bedrock of a genuine civilization that is faced with the forces of barbarism. Right-wing Senator Lindsey Graham was the first keynote speaker. Graham, a 2016 GOP presidential candidate who has vehemently opposed the Iran nuclear deal and who has come under fire for overtly anti-Iranian racism, fawned over Israel. “Have you ever stood on the Golan Heights?” he bellowed, referring to the Syrian sovereign territory that has been illegally occupied by Israel since 1967. In regard to Hamas retaliation against Israel’s bombardment and subsequent ground invasion, Graham asked, “What would we do if we were attacked?” His question wasn’t rhetorical: “I can’t say it here; because this is a Christian gathering, God bless you,” he answered. He commended Israel for making the land of historic Palestine “available to us [Christians]”—which he ahistorically claims “wasn’t always” the case. Thank Israel “for allowing us to walk in Jesus’ footsteps,” the senator told his captive audience. Graham touched on all the right-wing talking points. The Republican senator, who vehemently opposes abortion and the funding of contraceptives in health care, also used a form of imperialist humanitarian pseudo-feminism to defend Israel’s war crimes. “Compare a woman in Israel to a woman in another Arab country,” Graham said—failing to acknowledge the fact that the US’ closest allies in the region after Israel are theocratic Gulf monarchies in which women are not just culturally but also legally subjugated. “Thank God for Israel, on behalf of all the women,” he added. After Graham proclaimed “When you support Israel, you support the rule of law,” someone in the audience shouted “Impeach Barack Obama!” The audience collectively laughed and applauded. The Israeli military “tries to minimize casualties” and “put itself at risk to save civilians,” Graham continued. “Compare their ethics to that of their enemy. Pray for the IDF,” he implored listeners, before more applause. “Don’t ever turn your back on Israel, because God will turn His back on us,” the US senator concluded. Iran was the target of much scorn that night, among all of the speakers. CUFI founder and apocalyptic anti-Semitic Evangelical pastor John Hagee, who spoke again as the second keynote, was arguably the most extreme in his characterization of the Islamic Republic. Hagee explicitly spoke of Iran as the new Nazis. He warned Iran’s leaders are on the verge of destroying the universe with nuclear weapons. You can say that last part again. It goes without saying that, in typical Hagee-ian fashion, the CUFI leader saw no problem in bringing up and wielding the specter of the Holocaust for political gain. Two sections about university outreach followed in the program, titled “The Campus and the Millennial Challenges” and “CUFI on Campus Report.” Both talks were full of baseless anti-BDS smears. Israeli Ambassador to the US Ron Dermer was the third and final keynote speaker. While the first two keynote speeches were not covered in the media, the press did pick up Dermer’s talk. Slate‘s David Weigel (who wrote one of the only critical long-form reports from the inside) described the ambassador’s keynote as “hellacious.” The publication also indicated that “the media was sitting at the back of the room,” but apparently no one considered it worth their time reporting on the extreme remarks of Senator Graham and Pastor Hagee—the apocalyptic leader of one of the world’s largest pro-Israel organizations. While Dermer was speaking, bombs and bullets were raining down on Gazan civilians. Around 2,300 Gazans, mostly civilians, would be killed in the seven-week war Israel waged against the strip. Over 500 children lost their lives. CUFI cheered on the carnage. On the Israeli side, just six civilians were killed, one of whom was a Thai national. When the summit took place, there had only been a small handful of Israeli casualties. Dermer, nonetheless, presented Israel as the the oppressed and besiedged Palestinians as the oppressor. While Israel’s onslaught was being carried out, Amnesty International, Human Rights Watch, and other leading human rights organizations accused the IDF of war crimes. The Israeli military purposefully targeted hospitals, UN shelters, schools, homes, and more. In the year since, numerous Amnesty International investigations have accused the IDF of war crimes and possible crimes against humanity. An independent medical fact-finding mission conducted by Physicians for Human Rights-Israel (PHR-Israel) detailed how the Israeli military deliberately killed Gazan civilians. PHR-Israel documented the IDF’s use of human shields, close-range murder of civilians, targeting of medics and ambulances, employment of unconventional weapons, and more. The UN Independent Commission of Inquiry on the 2014 Gaza Conflict also accused the IDF of blatantly violating international humanitarian law. Throughout that night in July 2014—while I was bombarded with doomsday fearmongering about the supposedly imminent destruction of Israel by “the Islamic Republic of Iran,” juxtaposed against joyous, earsplitting music, singing, and dance—I couldn’t help but think of the Gazan Christians being massacred with weapons paid for with US tax dollars, while American Christians shouted praise at Benjamin Netanyahu like young teens at an early The Beatles concert. A year later, the illegal siege of Gaza continues; the illegal occupation of the West Bank and East Jerusalem approaches almost its fifth decade; and the illegal colonization of Palestinian land accelerates. Few of the approximately 19,000 Gazan homes destroyed in the war have been rebuilt. Up to 100,000 Gazans remain homeless. That night, sitting in an enormous hall, surrounded by thousands of bloodthirsty CUFI supporters, I couldn’t help but think of what Jesus himself would have said, if he had seen all these Christians rejoicing in violence, reveling in death. Whew. So much hate and elation. ugh. You write beautifully, descriptively, and humorously, Ben. I am surprised that you made it through the program~ I do not think I could have. Did you suffer any temporary damage like singed hair or something? Are you kidding me? Isn`t it hate what YOU are doing all along? You have just been enthroned the King of One-sidedness. These guys do it out of LOVE, not hate, with no self-interest involved at all. No matter how Jungle-like the world has turned into there will always be somebody holding the torch in the darkness. It also goes to explain why the so much bigger anti-Israel worldwide camp, broadly speaking, has not been able to prevail for generations now – and despite all the infinite energy spent there. I feel literally nauseated …. sickened at the lying, hypocritical , ignoramus and unmitigated idiocy of this CUFI leader ,the Hagee so -called pastor, and his cohorts the speechifiers. Messers .Graham & Dermer. Coming after reading the article about the baby that was so wantonly murdered by fire while asleep in his bed… what can I say! I admire your steadfastness, Ben , for having the fortitude to sit through it all . I bet you felt you needed to wash your ears after that massive verbal assault on decency and human kindness ! “People were excited. I even pretended to be”. Ben, you were so easy to spot as the odd man out, your eyes were not glazed over. They should all be in straitjackets. Thanks for sharing, Mr. Norton. 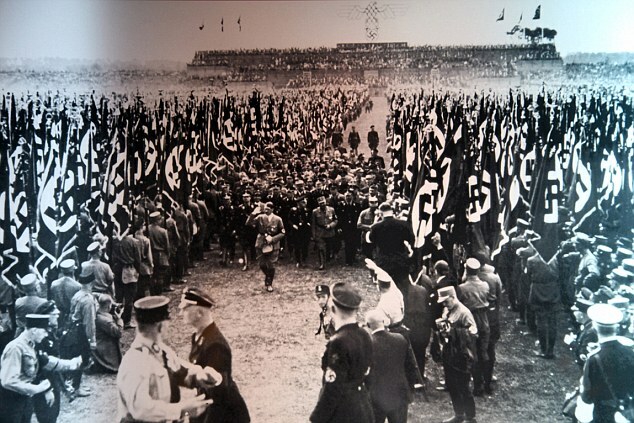 Imagine what Leni Refienstahl could do with this orchestrated frenzy! Thank you, Ben. I sympathize with your contempt for flags. I hate all flags, and all nationalism too. But I have exceptions. As someone who grew up in a deeply evangelical home, I read the Bible cover-to-cover twice and Hal Lindsey’s works all before I turned sixteen. But I think it’s a mischaracterization to think of Christian Zionists as anti-Semitic. Yes, Christ will return and damn Jews who haven’t been born again to the fiery depths of Hell for all eternity. But he will damn anyone who isn’t born again, or so they believe. That includes Hindus, Muslims, Buddhists, and even many Catholics, many Mormons and many mainline Protestants like myself who don’t subscribe to a narrow definition of Christianity. Christian Zionists are in fact philo-Semitic. And you don’t need a black friend to confirm that this is environment is racist. But Christian Zionist racism is primarily focused on Arabs and Muslims. Herman Cain, Alan Keyes and Allen West are at home. Well, if they are philo-semitic, I’ll take my admiration from afar afar as possible. Oh, everybody thinks Jews have all the money! Mooser, when I count my blessings and good things, I count your comments. I thought that’s what the Moderators do. You can’t expect me to do their job, that wouldn’t be right. Yes, Christ will return and damn Jews who haven’t been born again to the fiery depths of Hell for all eternity….. he will damn anyone who isn’t born again, or so they believe. That includes Hindus, Muslims, Buddhists, and even many Catholics, many Mormons and many mainline Protestants like myself who don’t subscribe to a narrow definition of Christianity. let’s ask ourselves, considering this circumstance, why someone would characterize this as ‘anti semitic’? since it includes everyone else who is not their definition of christian, if one in fact did believe it was a bigoted remark, why wouldn’t it be characterized as racist to all mankind who is not christian? why single out jews or anti semitism per se? and please show me where this argument is made (outside of the context of referencing jews). i myself have expressed what i think of these christian zionist freaks in the past. clearly i think they are an aberration — really freaky — for a number of reasons. i would not argue they were not racist per se, i’m sure many of them are or may be. but why the focus on bigotry against jews? what makes them (jews) stand out in the crowd, other than the fact christian zionists seem obsessed with protecting them or something or claim to love them so much. unlike say — muslims or others in the group. @RobertHenryEller. You may want to review the arguments by many commenters on a previous post by Ben Norton. Many comments make the same point. Why, thanks! You Mods are always on the ball! i just noticed how mr.eller isolated that sentence from the surrounding context. which begs the question – why? Probably because it violated one of the Ten Commandments, or the excellent precepts of Rabbi Hillel. Many, many people have advised me to go to Hillel. MY COMMENT: It’s a bit reminiscent of the Parade Grounds at Nuremberg. Oh, the spectacle! Goebbels would be proud. Edited video of Adolf Hitler in Nurnberg with background music of Clubbed to Death ( Kuruyamino mix ). Yes, it’s incredibly chilling. It virtually makes my skin crawl.
. . . The first convention I covered as a reporter was the Democrats’ return to Madison Square Garden in 1992. By then, whatever residual suspense conventions offered had been leached away. In 1984, there had been at least the suspense of whether Kennedy would shake Carter’s hand (he sort of did, begrudgingly, but only after a desperate Carter chased him down on the podium following his acceptance speech). Though suspense had been banished from conventions, drama still remained—in ’92, the drama of Bill Clinton’s emergence, augmented by the best walk-to-the-podium-to-accept-the-nomination I’ve seen before or since: Clinton was filmed from behind walking through some Madison Square Garden labyrinth of otherwise-deserted halls, until a curtain parted and he emerged into the blinding light of the convention floor. . . I find it difficult to understand how people who believe in things like breeding red cows to hasten the end of the world can function, even thrive, in the modern world. “Compare a woman in Israel to a woman in another Arab country,” Graham said—failing to acknowledge the fact that the US’ closest allies in the region after Israel are theocratic Gulf monarchies in which women are not just culturally but also legally subjugated. Thanks for the video JLD! Great music too. Yep, I can see where they got the flag idea from. So incredibly similar (and not just the flags). Yes, oddly “Clubbed to Death” (note the play on words) puts a very interesting “spin” on Lina Wertmüller’s footage from the Nuremberg rally. CUFI makes perfect sense when you realize and accept that fundamentalist Christians are not Pro-Life. Fundamentalist Christians are Pro-AFTERLife. Fundamentalist Christians have absolutely no interest what goes on here, on Planet Earth, except that they are preparing for Eternal Life in Heaven. What happens to Jews, to Palestinians? Who cares! They’re all going to Hell anyway. We Good Christians just have to make sure they’re all in the Right Place at the Right Time. In fact, because of their Pro-Afterlife fixation, fundamentalist Christians do not even care what happens to themselves here on Earth – which is the key point in making sense of their behavior. What does a lifetime matter against Eternity? If there is anything deliciously absurd about CUFI, it’s the the Christians think they’re using the Jews, and the Zionists think they’re using the Christians. So, they’re the Best of Friends! What makes these people truly scary and dangerous is that these people, two million of them, are not only not afraid to die, they are actually looking forward to death? Who does that remind you of? Jihadist suicide bombers, perhaps? So what is more important while on Earth than to fulfill “God’s prophecies” and guarantee your ticket to eternal life in Heaven? Please don’t take them so seriously. That’s what they live for. I don’t know how you did it, Ben! But I admire you. Thank you for enduring it. The second photo was funny. Seriously, you know what I thought I was seeing in that photo until I read the caption? Just an aside, does anyone else think that the acronym CUFI sounds well, a little icky? What do you notice in the name CUFI? So if the Israelis are so embattled, why don’t they let Christian Zionists sign up for the Israeli army? I don’t think that there are any Israeli military forces that allow nonJewish noncitizens, correct? There are cases of people writing online saying that they want to serve the Israeli military and they want to know what program or division to go into. But it seems like despite the rhetoric of being embattled, this nuclear armed state wants to keep their Christian Zionist supporters and everybody else at arms length when it comes to helping out. Jones, do you really think that is you include some chapter-and-verse numbers, it somehow makes real history out of those religious writings? You are comparing a group, people that are right in front of our faces with something out of the Bible, as if they had an equal reality? Ho-Kay! Are you skeptical that in the ancient Middle east there was a snake cult? The book of Isaiah professed an ongoing belief that the highest order of angels were flying snakes in the verses that I mentioned. The Sumerians worshipped a serpent god or goddess named Ningishzida, an ancestor of Gilgamesh. Before the arrival of the Israelites, snake cults were well established in Canaan in the Bronze Age, for archaeologists have uncovered serpent cult objects in Bronze Age strata at several pre-Israelite cities in Canaan: two at Megiddo, one at Gezer, one in the sanctum sanctorum of the Area H temple at Hazor, and two at Shechem. In the surrounding region, serpent cult objects figured in other cultures. A late Bronze Age Hittite shrine in northern Syria contained a bronze statue of a god holding a serpent in one hand and a staff in the other. In sixth-century Babylon a pair of bronze serpents flanked each of the four doorways of the temple of Esagila. At the Babylonian New Year’s festival, the priest was to commission from a woodworker, a metalworker, and a goldsmith two images, one of which “shall hold in its left hand a snake of cedar, raising its right [hand] to the god Nabu”. At the tell of Tepe Gawra, at least seventeen Early Bronze Age Assyrian bronze serpents were recovered. The animal worship didn’t go away totally. Witness the Yazidis who worship the leading predatory bird devil/ex-fallen angel Melek Taus and make statues of him. How is that less bizarre than a mixed-political-revivalist CUFI summit? I am under the impression that the snake cult still survives in some area along the southern Turkish border. Yes, in terms of its ideology, Christian Zionism is bizarre because they are celebrating the Israeli state while predicting an apocalyptic destruction of anti-Christian Israelis. But is it really that hard to think of more bizarre groups? How is the practice in the Torah of a whole nation bowing down (implying worship) to a snake on a staff in the desert, along with the Torah’s belief in high-ranking “snake angels” (For the literal meaning of “(seraphim”, compare: 6:2–6, 14:29, 30:6) less bizarre? Why else did Hezekiah destroy the snake staff in the Temple? But which is more “bizarre”? Isn’t a CUFI summit, with Ashkenazi music, shofar playing, political stumping, and apocalyptic preaching perhaps less bizarre as a phenomenon? oh my, this is the first i’ve ever heard about the fire snakes in the desert – who thinks up this stuff? sometimes i think the less i know about religion the better. I think that nearer to the Christian era, the Jewish philosopher Philo laid out the idea that God included a Creator, a Spirit, and a Word, which correlates to the components of Christian theology. However, eventually, either due to centuries of simplification, the dispute with Christianity, or both, this Trinitarian view was rejected in the nonChristian community. Some scholars go even farther with the concept of “cover up”, and claim that originally Israel’s religion was polytheism like the surrounding Canaanites practiced, and that you can see this in the beliefs about snake angels, the worship of the snake on the staff, the sending of the goat into the wilderness, etc. The worship of the bronze snake could point to an earlier Israelite worship of a snake god, who would correlate to one of the seraphim. And the sending of the goat into the wilderness could reflect a belief in a goat deity, which in Greek mythology was the half human goat deity Pan. Likewise, goats and rams could be used for sacrifice to such a deity. And the warning in the Torah against worshiping the goat gods (satyrs) could have meant that it was an earlier “mainstream” practice like the worship of Pan was in Greece. Then centuries later, King Hezekiah comes along, and the Bible says that he destroyed the bronze snake in the temple because people were worshiping it. Then there is also the curious story about the finding of the Law (literally the “Torah”) in the Temple somewhere between the era of Hezekiah or Josiah. It’s curious, because does this story mean that they just found the Israelite laws in the Temple centuries after Moses was alive? So the Torah was not really something that had been followed by the whole nation for centuries since Moses was around, and was instead imposed later and portrayed as if it had been the original teaching? Maybe I am misreading this incident. So anyway the “conspiracy theory” of some academics is that ancient Israel was actually polytheist or worshiped other gods including the snake god, but then one of their kings imposed Monotheism on them. And to do this he would have to rewrite their history. But I don’t know. The Torah does have a much older style of writing than the Psalms of David (1000 BC). Maybe the Torah did come from the time of the alleged Moses (1500-2500 BC), but even at that early date it reinterpreted many aspects of Israelite religion and history. I don’t know if any of the snakes are considered to breathe fire. But there are mentions of dragons in the Tanakh, so maybe when it talks about supernatural serpeant beings it means that they breathe fire. And this reminds me of the story of how Isaiah began to prophesy his important, secretly Christian prophecies – one of God’s “snake angels” (seraphim) came and put a coal on Isaiah’s lips. I was a Trinitarian myself for a while. Went around flailing a guitar and asking girls to “light my fire, light my fire”. Doesn’t work, not for me, anyway. And I needn’t mention, need I, that you know who you are, you “some” scholars! No, don’t look away, I see you! I was wrong. I was actually committing Feliciano. God, it’s painful to read their virtual reality. I’m visiting relatives right now who hold the same views. But the article is a keeper, Ben, for when I see the crack in their darkness.